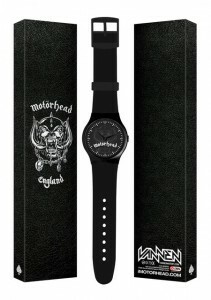 The Motörhead “Warpig” (Grey) Vannen Watch is NOW SHIPPING. 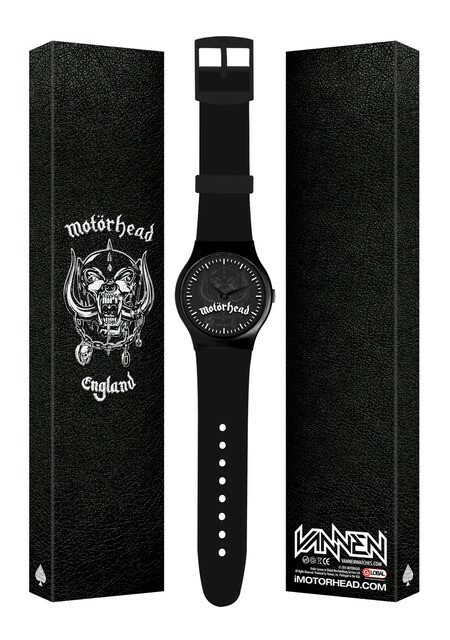 This watch features a classic matte black finish, with index markings and the Motörhead logo printed in white on the inside surface of the crystal. The durable stainless steel back casing of the watch is also engraved with “Born To Lose / Live To Run”, and a spade is engraved on the watch’s crown. Each of special edition “Warpig” (Grey) Watch come packaged in a custom embossed sleeve with an exclusive Motörhead sticker. Water resistant up to 10 meters / 30 feet. Comes with a Limited 90-Day Warranty. • Wrist: Med-Large. 8.5 inches Max. • Crystal: Plastic, Flat w/ White Art. • Movement: 3-Hand Japanese Quartz. • Buckle & Loop: Plastic, Matte Black. • Dial: 34.8mm, Matte Black w/ Dark Grey Art. • Hands: Metal, Glossy Black. • Case: 43mm, Plastic, Matte Black. • Straps: 22mm Wide, Plastic, Matte Black.